← STEP ’11: Free Family Theater in Local Parks! Washington DC, a place where dark secrets and blind ambition collide … and lives are destroyed. Representative Ethan Masters, a man who finds himself poised to step into the crosshairs of explosive scandal … or take the vice presidency in his grasp. All Ethan has to do is side with the lion of the Senate, Gilbert Stanton. Senator Stanton, a man who holds the key to the shadows in Ethan’s past … and to his future. 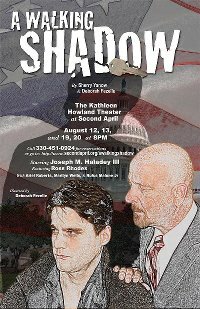 A WALKING SHADOW, a drama about choices, secrets, ambition … and murder. Starring Joseph M. Haladey III as Ethan. Featuring Ross Rhodes as Senator Stanton. With Marilyn Wells, Drew Schaar & Ariel Roberts. Directed by Deborah Fezelle. This entry was posted in arts, canton, Massillon, ohio, shows, theatre and tagged 2nd April, canton, Kathleen Howland Theatre, live, ohio, show, theater, theatre. Bookmark the permalink.